The Swell Season: 'Joy' At The Triple Door As a way of thanking its supporters, KEXP brought Glen Hansard and Marketa Irglova of The Swell Season to the Triple Door in Seattle. Without a band, the duo gave an intimate performance that showcased its deeply personal songwriting, including a new song and a blazing cover of Tim Buckley's "Buzzin' Fly." Here at listener-powered KEXP, we have a VIP Club Concert series exclusively for our members. It's a wonderful way to thank people for supporting our station while capturing intimate, once-in-a-lifetime performances from some of our favorite artists. We hold these concerts very near and dear to our hearts, and back in October, we were delighted to present The Swell Season to our members. 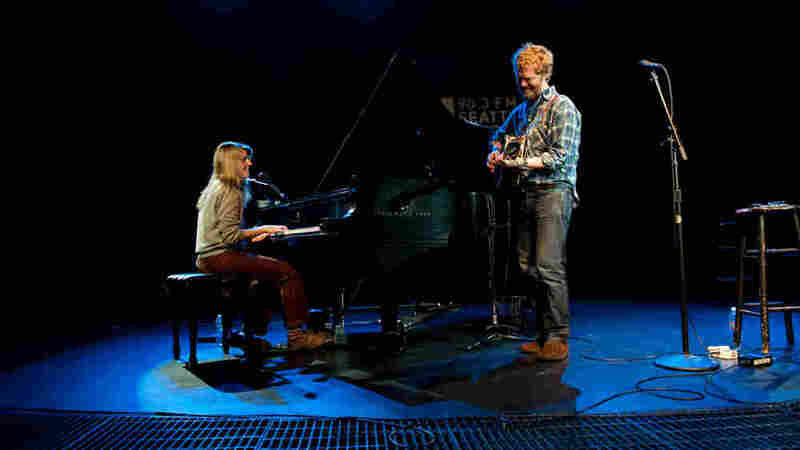 The Frames frontman Glen Hansard and Czech pianist and singer Marketa Irglova usually perform with a full band, but arrived as a duo for this performance. Irglova said she was fighting a cold, but sounded stunning to these ears. And Hansard had everyone in the audience in stitches with his sharp-witted stage banter. Of course, he also brought his beat-up acoustic guitar, which literally had a huge hole with splintered pieces of wood hanging from it. He had pinned a single autumn leaf onto the lapel of his blazer. They performed a stunning, stripped-down set of songs from their new album, Strict Joy, as well as from their award-winning soundtrack to the movie Once. The pair even treated us to a brand-new, as-yet-untitled song, as well as a blazing cover of Tim Buckley's "Buzzin' Fly," in which the two belted into a single microphone center stage. It was breathtaking.